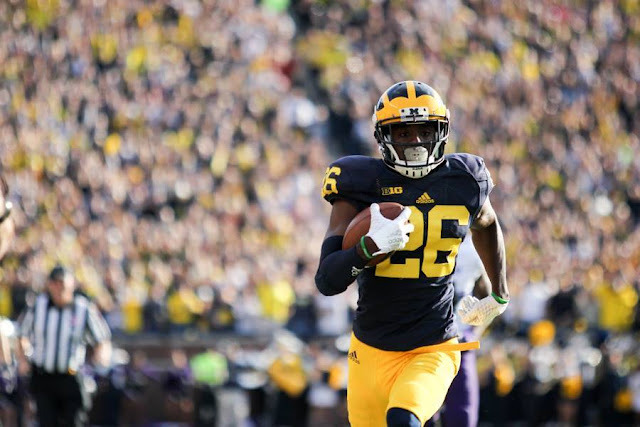 Maize and Blue Nation Football Writer Erick Lehman will be writing multiple Spring Game previews, and releasing new position group previews each day leading into the game. The Spring Game is scheduled for Friday April 1, 2016 at 6:00 p.m. and will be held at Michigan Stadium. The previews are looking into the Spring Game and will not account for incoming recruits who have not yet joined the team. Easily the strongest position group on the team, and probably the most boring to write and read about is the defensive backs for the Wolverines. We all know who will start, and who will play in the Spring Game, and regular season. But, is there anyone in specific to watch? Or anything in specific to watch? The answer to both of those questions is Jabrill Peppers. Where will he play, and what will he do? Peppers is reportedly going to play strong side linebacker for the Wolverines. Reportedly. I don’t know exactly what will happen, and it will likely depend on the play of some of the freshman linebackers to really know if he will play there. Do I expect Peppers to play linebacker? Sort of. I think he will be a hybrid. He will cover tight ends, or slot receivers, blitz here and there, but he will probably line up on the edge of the tackling box. Other than the usual suspects on the defensive backfield like Jourdan Lewis, Peppers, Channing Stribling, Dymonte Thomas, Delano Hill, and Jeremy Clark, who should we keep an eye on? Well the list is short for the Spring Game, because generally you’ll only see four or five defensive backs on the field at once, and my list of usual suspects consists of six. Those are six currently sitting on the roster. Tyree Kinnel is about the only other person to truly keep an eye on. Kinnel could be a very important reserve player come the regular season, and other than the six listed above, is the only other Wolverine defensive back on the roster at the moment that will see some actual time. If I had to take a wild crazy shot on anyone else seeing some time on the field it would be Jordan Glasgow, who is a safety. He is the third Glasgow brother to play for the Wolverines, and for that he has to at least be given some benefit of the doubt. Brandon Watson has been a special team’s guy, and will continue to be just that. The defensive backs are all set, the team doesn’t really consist of any dark horses who could come out and be the next great thing. There will be a few additions during summer camp, and those players will likely see more playing time than anyone else on the roster besides who I’ve listed, sans Glasgow.